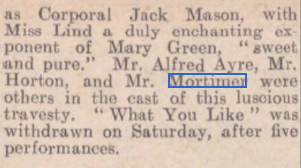 Charles Mortimer was in the cast of "What You Like", at the Fortune Theatre, London, from 20 - 23 April, 1932. This was collection of sketches from previous Green Room Rags. NEW ENTERTAINMENT AT LONDON FORTUNE. 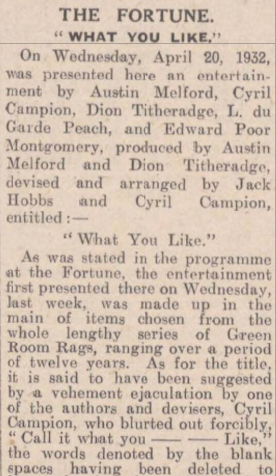 "What You Like" is the label for the new entertainment at the Fortune Theatre presented by Mr Jack Hobbs and Mr Cyril Campion. 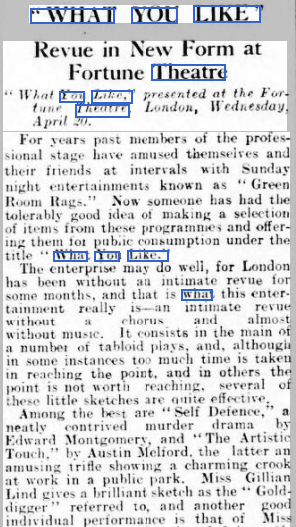 It is made up chiefly of items chosen from the "Green Room Rags" which have been given during the last dozen years, and those who have never seen any of these famous Sunday night shows have now the opportunity to taste a meal of dishes which have most pleased and avoiding those which got burnt in the cooking or were made up from an unsuccessful recipe. 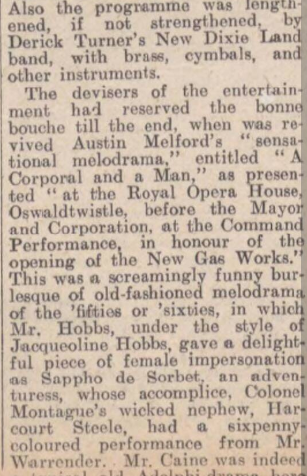 A revival of the sensational melodrama by Mr Austin Melford, "A Corporal and a Man", with the entire original cast as presented at the Royal Opera House, Oswaldtwistle, in honour of the opening of the new gasworks, allowed the actors to amuse themselves at the expense of an outmoded form of entertainment, and a t the curtain the audience played up by hissing the villain (Mr Harold Warrender) and the adventuress (Mr Jack Hobbs) and by cheering the good characters interpreted by Miss Gillian Lind and Mr Henry Caine. Many of the sketches were written on the usual revue formula of a last-line anti-climax. One of the best was Mr Melford's "The Artistic Touch". Miss Lind, as a lonely lady seated in the park, got Mr Jack Hobbs in conversation over a dropped tobacco pouch, and told him the tale of woe with some pathos that, to paraphrase the Doge's remark to Othello, "I think it would have won my money too". When Mr Hobbs had, with great delicacy, put some money in the book she was reading, and departed, the lady put the notes in her bag and threw down another pouch. "The Rebel Party", by Mr Campion, showed how the politicians of the State of Meccapo know how to trim their sails as well as those nearer home. The Chancellor, however, thought his colleagues might take lessons in imposing taxation from England, "a country which loves to have bigger and better taxes", Miss Mary Merrall brought a note of real tragedy for a moment in a sketch by Mr Dion Titheradge, and Mr Edgar Norfolk, Mr Charles Mortimer, and Miss Lind gave us a creditable essay in Grand Guignol by Mr E.P. Montgomery. 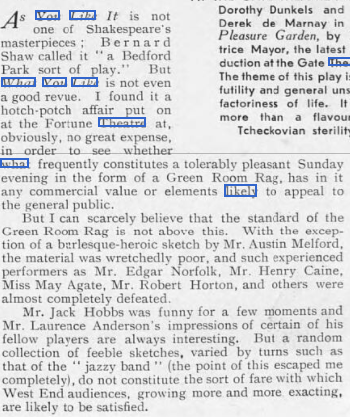 Mr Derek Turner showed how needless is a conductor by leading his band from a position where not one of the players could see him, and Miss Eve Beck pointed the imbenility of the sad jazz songs by enunciating each syllable with unkind clarity. From The Era of 27 April, 1932. This new-idea show was by Austin Milford and Dion Titheradge, and consisted sketches, songs, and lively old melodrama. The material was selected from the whole series of the Green Room Rags that have been held during the past twelve years. 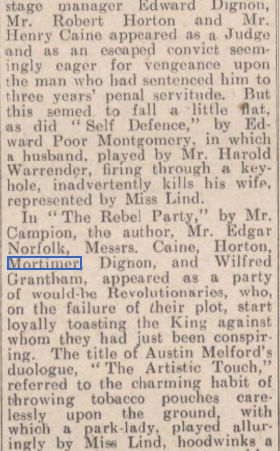 Self Defence is an ingenious sketch by Edward Poor Montgomery, in which man shoots another man order to get his wife, but by a strange twist fate, unknowingly shoots the wife as well. 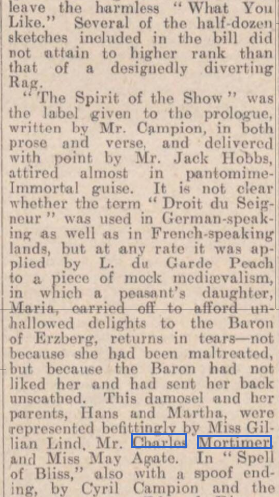 This was well acted by Edgar Norfolk, Charles Mortimer, Gillian Lind, Harold Warrender, and Robert Horton. The Artistic Touch is a slick crook episode by Austin Melford, and Dion Titheradge’s. “The End" is a dramatic sketch, in which a famous novelist drugs his wife to death his efforts to make her write for him. L. du Garde Peach contributed a neat sketch in Droit du Seigneur. 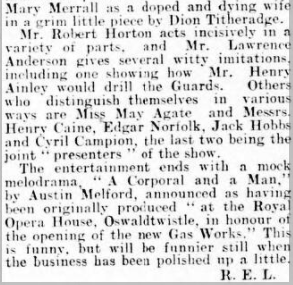 The melodrama of Mary Green, her loving corporal and the bad man and bad woman, etc., was a good thing, and really had a touch of the old melodrama about it. 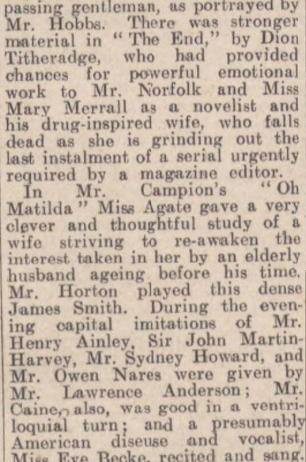 It is by Austin Melford, and was well acted, with most effective scenery. At one part of the evening Laurence Anderson gave several character studies, including Sir Johnston Forbes Robertson, Owen Nares, Henry Ainley, and Sydney Howard, which were very clever indeed. R. B. M.
From The Sphere - Saturday 30 April 1932. From The Illustrated Sporting and Dramatic News - Saturday 30 April 1932. 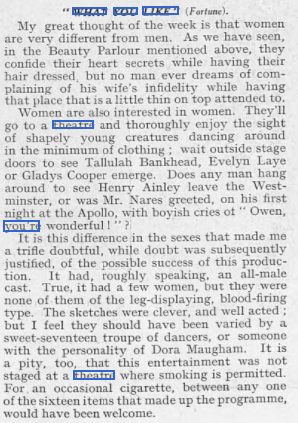 From The Yorkshire Post and Leeds Intelligencer - Thursday 21 April 1932.